It is most popular in India. 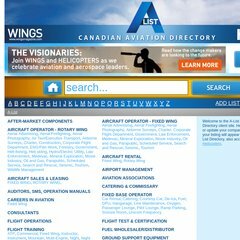 Topics: Canadian Aviation Guide - A-list, Canadian Aviation - Wings Magazine, A-list, After-market Components, & Aircraft Operator - Rotary Wing. The programming language environment is PHP/5.2.17. Ncs Technologies (Ontario, Simcoe) is the location of the Apache/2 server. PING (174.140.186.223) 56(84) bytes of data.